DrumCore 4 Ultra is an AAX/VST3/AU plug-in instrument with over 50 GB of 24-bit audio loops, MIDI loops, multi-velocity sampled drum kits, groove browser, song timeline, mixer, effects and more. This product is for new users. If you own a serial number for DrumCore 2.5, DrumCore 3 or KitCore 2, see the upgrade page. Includes 50 GB of content on a 120 GB as a download (no Solid State Drive). No drive needs to be shipped, so you save on shipping fees, and don't have to wait for it to arrive. Information about how to download and/or move content to your own external drive can by found in the DrumCore 4 User Guide pdf. DC4 Ultra content includes 263 GrooveSets (22,000 audio loops and 3,000 MIDI loops) by 18 drummers below, and 139 multi-velocity sampled Drum Kits. *Higgins was not in DC3 Deluxe, but is in DC4 Ultra. Ultra has 157 more items than Prime ($4.99 ea. when purchased individually) = $780 more content than Prime for $400 more than Prime. Ultra Plus has 480 more items than Ultra ($4.99 ea. when purchased individually) = $2395 total value when you buy Ultra Plus for only $2060 more than Ultra. Save $335. You get the same plug-in no matter which edition you choose. Editions allow you to choose the amount of content, and whether you get it as a download, on a USB Flash Drive, or on a Solid State Drive. Buying an edition on a drive provides instant access to the content with less downloading, and makes it easy to use it in different studios. Buying a download allows you to download the content without paying for shipping or waiting for a drive to be shipped. Additional content for each edition is available in DC4's store. DrumCore 4 Lite ($49): Download 4 GB of content, including 24 GrooveSets (1,400 audio loops and 800 MIDI loops) by 13 drummers, and 11 multi-velocity sampled kits. 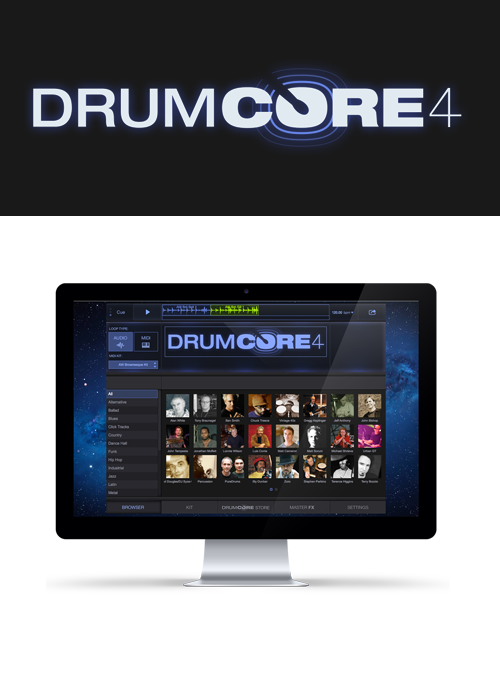 DrumCore 4 Prime Link ($249): Download 20 GB of content, including 160 GrooveSets (10,000 audio loops and 2,000 MIDI loops) by 17 drummers, and 100 multi-velocity sampled kits. DrumCore 4 Prime Flash ($249): Same as Link, but on a Flash Drive. DrumCore 4 Ultra (SSD) ($639): 50 GB of content, including 265 GrooveSets (22,000 audio loops and 3,000 MIDI loops) by 18 drummers, and 139 multi-velocity sampled kits. Delivered on a USB3 SSD hard drive. DrumCore 4 Ultra (Download) ($639): Same content as included in Ultra on a SSD, but no drive is included, which means no shipping cost or wait time for shipping. DrumCore 4 Ultra Plus ($2699): 90 GB of content, including all the drum content available for purchase in the DC4 store as of 4/4/18, which is 900 items (GrooveSets and Kits). Available on a USB3 SSD hard drive. DC4 is available for new and upgrade customers. U.S.: Buy any DC4 edition from this store or select dealers. Non-U.S.: Buy a downloadable DC4 edition from this store or select dealers. While this store supports only U.S. shipping addresses, we can ship almost anywhere. If you want a shippable product, email the product name and your mailing address to sales@sonomawireworks.com. We will reply with an invoice (including tax and shipping rates) that you may pay with a credit card or Paypal. Shippable products are also available from select dealers .